It's still hot here in Houston.We're talking temperatures in the upper 90s to lower 100s with high humidity and forecasted thunderstorms every day in the forecast. Because of the heat, camping's not on my radar just yet — not until conditions become more bearable in late September and October. Still, that doesn't stop me from dreaming. This year, I aim to try something new for maximum enjoyment of the Southeast Texas Gulf breeze: hammock camping. Here's the good and the bad. 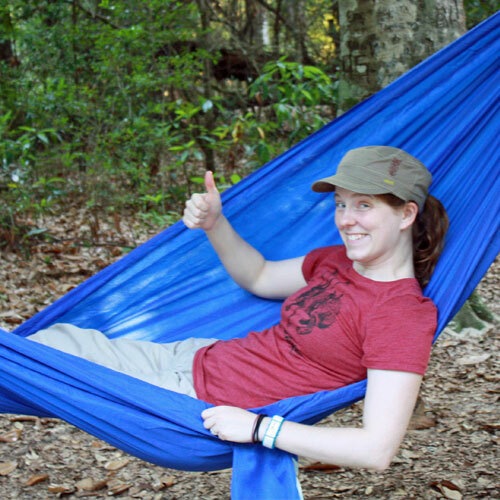 I'll be bringing my trusty hammock, a Byer Traveller Lite Hammock, available for under $25 from REI. Able to support up to 250 pounds and weighing 10 ounces with a handy pouch for glasses and books on the side, it's definitely lighter than a tent! I've heard good things about Hennessy Hammocks, which are really made for sleeping, while mine seems to be more for car camping or recreation. Still, before I invest all that money, I want to make sure I even like the concept. I'll be bringing a tarp to string up over the hammock as a rain fly. I'll also have guylines and stakes on hand to make sure the tarp stays put.I've got a hammock suspension system. I'll be bringing to connect the hammock to trees. Failing that, I've got a long rope I can use to string it up. I'll be bringing my sleeping bag and camping pillow, as well as a mat to line the bottom of the hammock to keep my body insulated. Because I live in the land of really, really big bugs, I'll be purchasing a mosquito net like the ENO Guardian Bug Net to enclose my hammock. I'll be sure to give a full report, but in the meantime, let me know if you have any questions or recommendations.